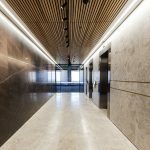 IA Design was engaged by Investa and CBRE to design and deliver two show suites and a bathroom and lobby upgrade within level 6, 66 St Georges Terrace. IA Design worked closely with CBRE and builders Aurora to ensure that these spaces would appeal to a wide variety of potential tenants to not limit who will lease the space. The show suites were designed in opposing materials and finishes. Tenancy B was designed with rich dark fabrics and leathers whilst the tenancy C was designed with a light palette. These ‘ready to move in’ spaces were designed to lease quickly and reliably, designed to be flexible and appeal to a wide variety of potential tenants. On the same floor, IA Design upgraded both the bathrooms and lobby in-line with previous floors completed. The final outcome is a modern and impressive show floor that is well designed and will assist CBRE in leasing these spaces.